Engage students in active learning with Power Pen! 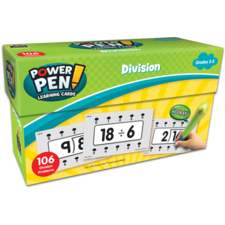 Use the Power Pen Math and Reading Comprehension Cards to build skills and reinforce learning. With the easy-to-use Power Pen and Power Pen Learning Cards you simply select an answer and receive immediate feedback with an audio and visual response. 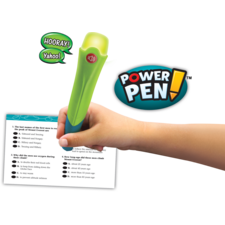 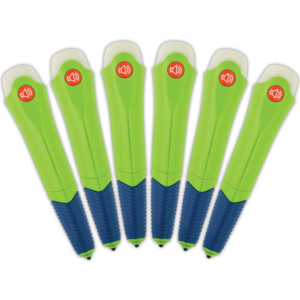 The Power Pen sends positive responses to correct answers and encouraging redirection for wrong answers, keeping students motivated and on track. 6 pens per pack. 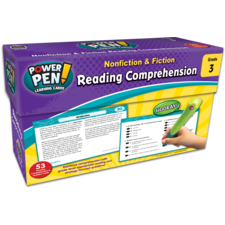 Students love the sound effects. I like the volume control! I bought this product through the library to be loaned out to my teachers. They have just started using them and are quite excited about having another small group activity that the students will be able to do without much help. I made up kits of six power pens and the grade 1 or grade 2 level cards in the containers and the teachers can check them out for periods of time to use with their students in small groups. They are simple enough to use and I hope the batteries last a long time but time will tell.